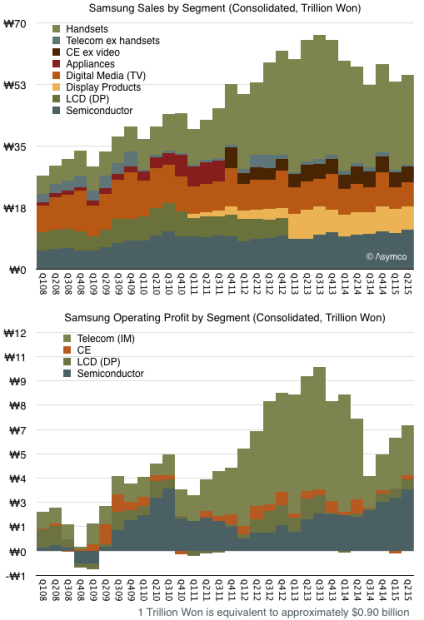 Will there come a time when Samsung will earn more profits from the iPhone franchise than from its own Galaxy product line? Phone operating margins peaked in Q1 2014 at 20% but are half that level today. 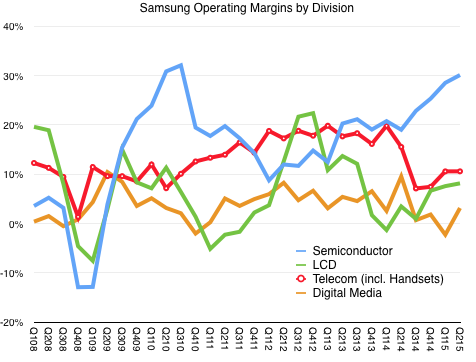 These margins have dropped to levels Samsung had in 2009, before the Galaxy launched and before they had any substantial revenues from smartphones. Samsung is a supplier in the Apple network and a licensee in the Google network. As a result, it has a near monopoly position with a platform controller (Apple) and a commodity position with a platform licensor. Neither position is one of control, but the current market stage benefits Samsung within the Apple ecosystem more than in Google’s ecosystem. It’s a situation analogous to one where Intel made both x86 chips and PCs that ran Windows. Long term it’s likely that the sole-source chip business does a lot better than the multi-source systems business. That should be a warning to others who hoped to survive as Android OEMs. They don’t have semiconductors to sell to Apple.